Description: While the grade up to Summit is steep, this angle is sure dramatic. Description: Amtrak train 52 northbound at track speed on the A-line near Barberville. This was during the time that the Auto Train ran with a mixture of Superliner, Heritage (including at least one dome) and Amfleet cars. Date of photo approximate. Description: Q271 waits for a new crew on the NYSW, having just come up from Binghamton while an eastbound Amtrak Empire Service train passes as it approaches its Syracuse station stop. Description: Amtrak Empire Service is represented at Solvay with a P40 and six cars passing he old Blue Circle Cement plant. It will make its Syracuse stop in about three minutes. Description: A pair of P40s lead Lincoln Service 304 into Joliet. Description: Westbound Amtrak "Missouri River Runner" pauses at Kirkwood Station on a very hot late June afternoon. This train was led today by AMTK 831 and AMTK 815 instead of the usual GE P42 DC locomotives--a rather uncommon sight on this Amtrak route. 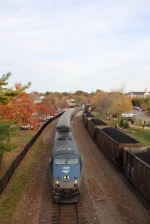 Description: Amtrak 392 Across The Interlocker in Centralia IL. Description: #4 flies thru Kewanee.